Photo: Prime Minister Sheikh Hasina holding a meeting with the Saudi business community at King Saud Palace. 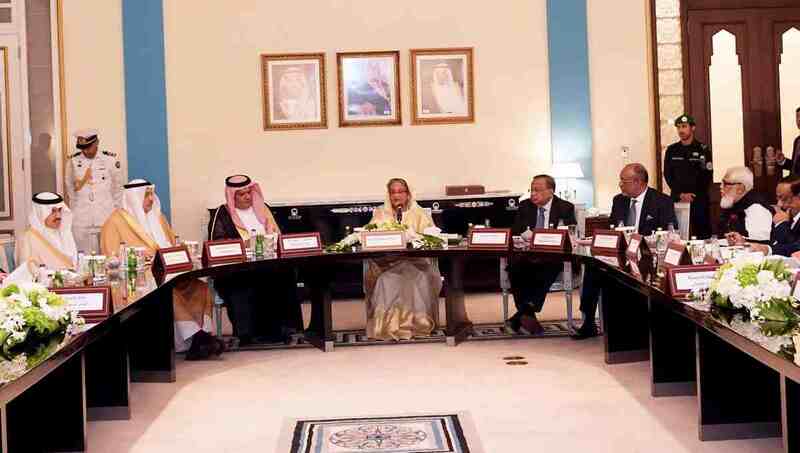 Riyadh, Oct 17 : Prime Minister Sheikh Hasina on Wednesday invited Saudi entrepreneurs to invest in Bangladesh for mutual benefits as both the countries lag behind in exploiting their full potentials of trade and investment opportunities. “We can join hands in our journey of shared profit and prosperity. I assure you of my government’s full support and cooperation,” she said. “We welcome Saudi entrepreneurs to invest in our emerging sectors like capital market, power, energy, telecommunications and IT, petrochemicals, pharmaceuticals, shipbuilding, agro-processing, light engineering, blue economy, R&D and technology innovation, water and marine and other infrastructure projects, and services sectors like, banking and finance, logistics, and human resource development,” Hasina said. “It also has low-cost electricity and water, good credit rating, minimum risk factors, and fast technology adaptability. All these facilities combined together, Bangladesh gives the maximum return and dividend to investors,” she said. “Trade relations between Bangladesh and Saudi Arabia date back to the seventh century when Arab traders first set foot in the port city of Chittagong. Both countries have reached an increasing level of bilateral trade in recent years crossing the USD 1 billion mark in 2017-18 fiscal year. But, we’re far behind in exploiting full potentials of trade and investment opportunities,” she added. Last year, Hasina said, Bangladesh’s economy was among the top-10 fastest-growing economies of the world. Despite the global economic turmoil, it maintained a sustained GDP growth over 7 percent during last 10 years reaching 7.86 percent this year. “We’re expecting to reach 8.25 percent GDP growth next year. At the same time, inflation has decreased to 5.4 percent. Foreign currency reserve has grown more than 9 times since 2008-2009, up to USD 33 billion in 2018,” she said. The Bangladesh delegation included Bangladesh Foreign Minister AH Mahmood Ali, PM’s Private Sector Development Affairs Adviser Salman F Rahman, Chairman of Bangladesh Investment Development Authority Kazi Md Aminul Islam, Foreign Secretary Md Shahidul Haque, Bangladesh Ambassador to KSA Golam Moshi.